Kolb’s (1984) Experiential Learning model proposes that we are naturally capable of learning, but experience plays a critical role in knowledge construction and acquisition. Experiential learning teaches students competencies for real-world success. Although we can simulate the real world in the classroom, lab, and studio – authentic experiential learning creates an invaluable opportunity to prepare students for a career. CONCRETE EXPERIENCE: The learner encounters new experiences at co-op. Act: Taking on new projects, responsibilities, being an integral team member. Learn new skills sets: software, hardware, tools, devices, methods, processes, etc. Manage a project independently or collaborate with interdisciplinary engineers. REFLECTIVE OBSERVATION: The learner reflects on experience and identifies inconsistencies between experience and understanding. 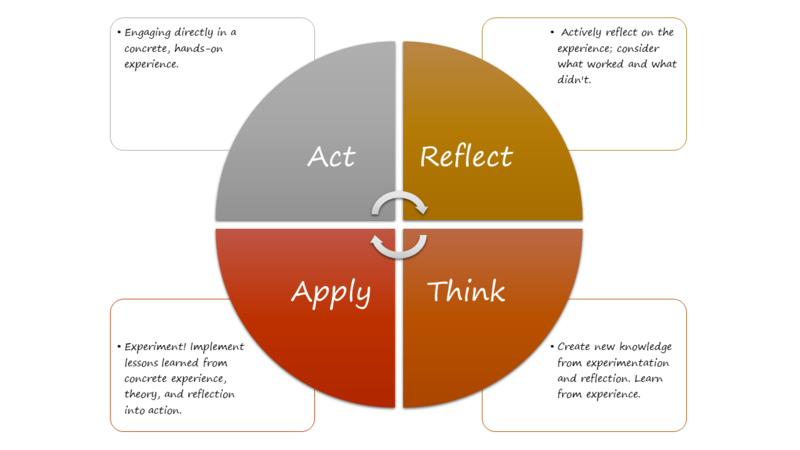 Reflect: Actively reflect on what is contributing to successes and failures. Keep a daily “journal” during co-op that details your accomplishments and best practices. Request meetings with your supervisor to reflect on your progress. After spending time researching and thinking, ask for assistance or clarification. Complete Self Evaluation thoroughly. Reflect on learning goals and progress. ABSTRACT CONCEPTUALIZATION: Through active reflection, the learner creates a new concept or modifies an existing one. Analyzes concepts to form conclusions. Think: Organize new information with pre-existing knowledge. Consider what is being learned on co-op, and how does it fit with lecture, studio, labs, projects, etc. Construct new meanings through hands on experiences or observation. Find more opportunities to uncover the “how” or “why” something is the way it is. Seek information and content on the new ideas: books, blogs, videos, etc. ACTIVE EXPERIMENTATION: The learner tries out new knowledge; applies conclusions to new situations. Engages in new concrete experiences! Apply: Actively apply constructed knowledge to new situations to deepen understanding. Take what you have learned on co-op and apply it into other co-op projects, coursework, lab, studio, capstone, and your next co-op or job. This often leads to new concrete experiences and the cycle continues! Experiential learning advances course based learning outcomes and increases employability skills. It encourages collaboration, an exchange of ideas, and lifelong learning. Co-op equips Wentworth students to evolve their understanding of complex topics and excel in their career. Kolb, D.. (1984). Experiential learning: Experience as the source of learning and development. Englewood Cliffs, NJ: Prentice Hall.